Slow Cooker Vegetable Beef Soup with is the most comforting, EASY soup you’ll make. You’ll want to dip crusty bread into the amazing flavors in this soup! 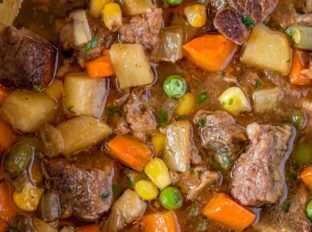 Slow Cooker Vegetable Beef Soup doesn’t sound like it would be the most amazing dish you have to make this season. I totally get it, the name sort of sounds like a canned soup you’d gloss over. What this soup actually is? AMAZING. 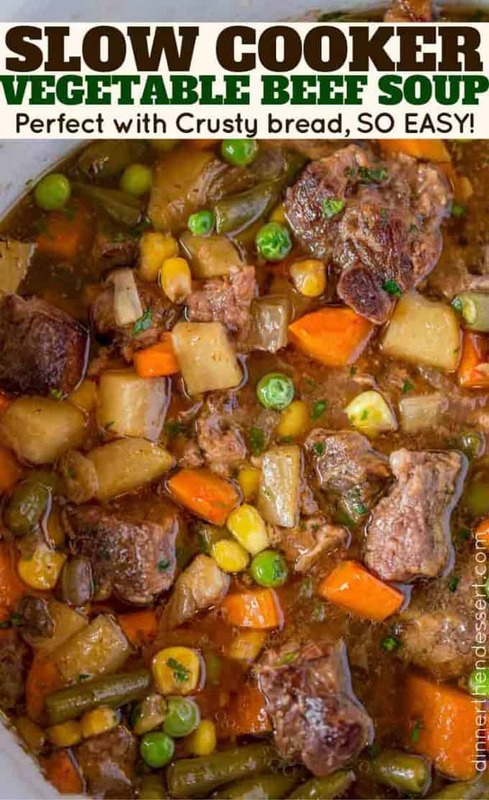 With a deeply rich, flavorful, gravy-like soup filled with genuinely tender bites of beef, potatoes, carrots, corn, peas and green beans, I promise you’ll actually feel a wave of warmth and comfort in this bowl of soup. In college there was a local French restaurant I LOVED. For $10 you were served a three course dinner including the most amazing rich beef soup and it was served with all the french bread you could dip in it. Honestly it was better than the main course or the dessert. This soup has been a close second for me. Every time we make it I set the slow cooker to cook in the early morning and my husband stops at the grocery store on the way home from work to pick up two baguettes of fresh French bread. Served with an easy salad with a lemon olive oil dressing, this is one of our favorite meals (and the kids love this soup too!). Brown your beef! I used a chuck roast, seared it well on both sides, then trimmed and cut it into chunks. I browned the beef in my cast iron skillet and got a GOOD crust on both sides with plenty of kosher salt and black pepper. Secret weapon? Beef Base! I use Better than Bouillon and you can see the good sized dollop I added. If not using a base use beef stock instead of broth and its even more important to get a good sear on the meat, then deglaze the pan with the stock to make sure all the beef flavor comes with it. Instead of diced tomatoes I use tomato paste, the concentration of flavors adds so much more. Serve this with crusty french bread, I promise you won’t regret it. Truth be told, I made this dish to photograph this week. Then I ended up not being well enough to eat it and had to be on a bland diet. When my husband warmed up a bowl of it for dinner I actually sat next to him just so I could smell it. It is that good. Don’t be fooled by the name or how easy the ingredients and prep are! 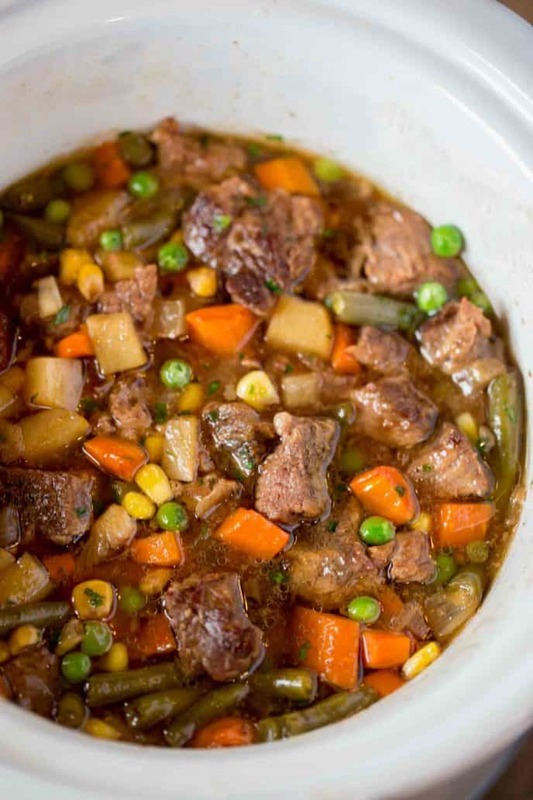 There is a lot of flavor in this beef and vegetable soup. I used frozen peas and added them at the end of cooking as they only need to warm through. Lets them stay vibrant and taste fresh. I used fresh green beans in the soup because I keep them on hand, you can use frozen. I used fresh carrots as the texture for fresh is always different compared to frozen carrots that can become rubbery. For the potatoes I used russet but also frequently make the dish with Yukon or even baby yukon potatoes. If you wanted a more fall flavored soup you could even swap the potatoes for sweet potatoes. Looking for more Slow Cooker Soups? 3 Qt. Slow Cooker: The perfect size for side dishes for 10-12 people, this slow cooker is an absolute bargain and a workhorse. Pig Tail Flipper: I use this to flip the chuck roast easily. I use this tool EVERY time I cook something that requires flipping, it is amazing. Beef Base: I almost never buy boxes of broth because I keep the beef, chicken and vegetable version of this Better Than Bouillon. Slow Cooker Vegetable Beef Soup with is the most comforting, EASY soup you'll make. You'll want to dip crusty bread into the amazing flavors in this soup! Heat a cast iron skillet or other heavy skillet on medium high heat with the canola oil. Season the beef with half the salt and pepper. Sear the beef for 5-6 minutes on each side until you see a deep golden crust formed on each side. Trim any large sections of fat and cut the rest of the beef into 2 inch chunks. 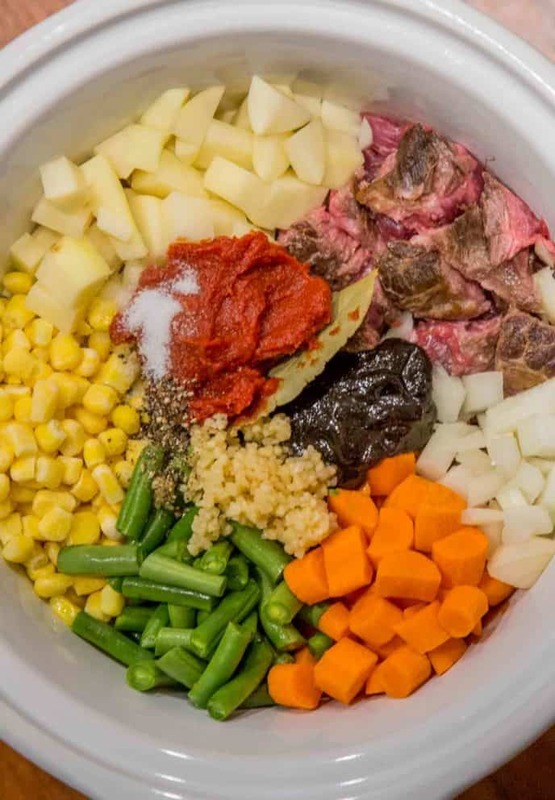 To slow cooker the add the beef, rest of the salt and pepper, potatoes, carrots, green beans, corn, garlic, yellow onion, bay leaves, beef base and tomato paste. Add water to your cast iron skillet on medium high heat and scrape up the browned bits in the skillet. Add the water to your slow cooker. Stir well and cook for 8 hours on low. Just before serving add in the frozen peas and stir. 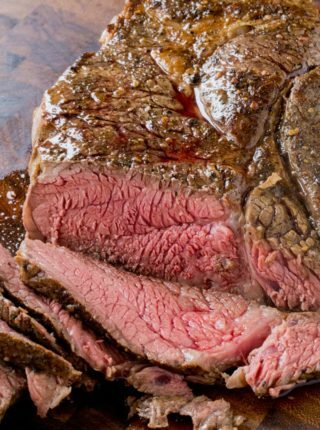 *Use a high quality beef stock if not using the base. Kinda waxed poetic about this recipe a lot huh? Haha. That’s how much I love it! Thank you so much Mary! Stay safe in your weather conditions and hope it starts to let up. At least you’ll stay warm with this soup. I tried this last week and it was delicious. My family loved it and said don’t try another recipe. This will be the one now that I will always make. How amazing! Thank you so much for coming back to let me know. I would love to try this out but I see you use a 3 quart slow cooker, would this turn out good in my 6 quart? Would I have to adjust anything? The flavor was perfect but 8.5 hrs not enough to completely cook potatoes. Low on my slow cooker is 225F degrees. Next time will try at 300F. Oh my goodness; just found this recipe & made it last night. It is delicious! Thanks for sharing! I might have sprinkled a bit on just for photography sake but totally optional. I hope you enjoy it! This was very easy, but a bit bland. Next time, I’d probably double the herbs and perhaps cook with red wine subbed in for some of the broth. Definitely feel free to customize more to your liking. Easy & very tasty. I added a touch of Worcestershire sauce to mine. This is an easy recipe to tweak as well. Glad to have this new recipe! Sounds amazing! So glad you enjoyed it, Crystal. Can’t have a be frozen with the potatoes and carrots in it ? Any tips ? Sorry, but I’m not sure what you’re asking. Can you clarify so I can help? FABULOUS! A keeper! Perfect for the Chiberia 24 below zero evening! So glad I was able to help in some small way to keep you warm! One of my best friends in the world is out there with you! So glad to hear it! Thank you so much for the review! Awesome soup. Can’t stay away from it! How much beef broth should I use? 5-6 cups of broth is needed for this recipe. Enough to cover the ingredients by about 1/2 inch. Hope this helps! I can not say enough about this! It is awesome. Just finished my first bowl. Love it. ? Decided to make this today. Everything has been cooking on low for about 3 hours now. Was wondering if i should add more water to my recipe since the only water i added was the water put into my cast iron to get the beef flavor out.. Concerned my soup wont be soupy enough. I hope this turned out well for you. The recipe card states to use 5 cups of water (enough to cover the ingredients by about 1/2 inch). Hi Sabrina, This looks delicious. I have never made Beef Vegetable Soup before, my mom always makes a big pot and gives my brother and me some. She uses Tomato Juice instead of water. Do you think that would be okay in this recipe? Also, could you use canned vegetables (corn, peas, green beans, & carrots) in this? Thanks for any help you can give me. I Have Not Made This But Did Give It 4- Stars Just For Looking Delicious. It would make it have a more pronounced tomato taste but if that’s what you’re looking for, you can go ahead and use that instead. Canned vegetables work for this recipe too, just drain the water before adding them. I hope you enjoy it! Very good! My chuck roast was closer to 2.5 lbs. I used a whole small jar of tomato paste, a whole bag if frozen corn and green beans. I also added an extra cup of peas (2 cups total) and a whole bag of baby carrots cut into thirds. I didn’t want to be wasteful. Therefore I added an extra tablespoon of the beef base because I needed more water. I used AP rub on the meat instead of just salt and pepper before browning in a cast iron skillet. We’ll make it again! 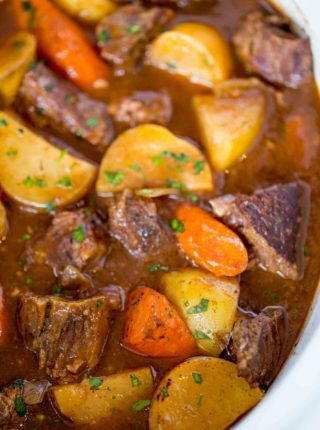 Can I use beef stew meat instead of chuck roast to skip the step of cutting it up? This is one truly delicious soup with the most amazing flavor!!! I had never made homemade vegetable beef soup before in my life, but a few months ago decided to make it because it was my guest’s favorite type of soup. I found this recipe online, and after careful research, I decided to give it a try. I have to say, it made a vegetable beef soup lover out of me and my guest absolutely thought it was the best. I used the Better Than Beef Bouillon, as recommended. Since I used a larger crock pot I had to use more water, so I used the whole 6 oz can of tomato paste. The only other change is I used some parsnips I already had on hand, and with the extra liquid, it worked well. Getting ready to make another pot of it today. Yum!!! Thank you so much! I’m so glad you found this recipe and decided to give it a try! I made the soup, but seemed to have a odd flavor. Maybe from th bay leaves?? (I really never cook with bay leaves so I don’t know the flavor). The meat was wonderful and tender. The broth not so good. I was so disappointed. What can add to help with the flavour? Tastes a bit watery. You can always add an additional scoop or two of beef base and up the seasoning to more of your liking. Hope this helps! I don’t know where I went wrong but after adding the meat and 2 sweet potatoes, my crock pot is full! 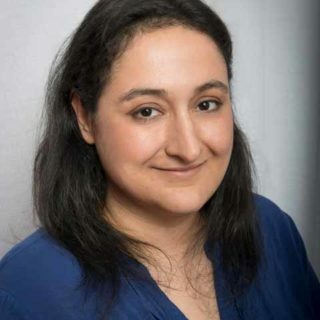 I’m breastfeeding a newborn so I was planning on making some adjustments based on foods she is less sensitive to…I was going to use sweet potatoes instead of russet and zucchini and squash with the corn, peas, and green beans. My mom said I can cook the other veggies separately and add them later so that’s what I plan on trying. Just not sure where I went wrong! I do think the cut of meat I bought was more and I opted to cook it all. I’m sure my baby brain isn’t helping! Oh no, what size slow cooker are you using? I was looking for a crockpot vegetable beef recipe to make. Found this one with great reviews, then tweaked it a little for my personal taste. Left the potatoes out and added 1 cup uncooked pearl barley instead. I replaced the peas with lima beans, then added 1 cup cooked sliced mushrooms. Fantastic soup. This is definitely a keeper. Thanks for sharing it. Oh and yes, the crusty bread is a must ! So glad you enjoyed it, Chris! Made this for supper and really liked the flavors. Will definitely add to my favorites! So glad you enjoyed it, Teresa! So glad you enjoyed it, Angela! Thanks for the 5 stars! This was not that great. Me or my boyfriend didn’t care for the flavor. Too bland. We will not eat this again. Hi. Making this recipe right now and getting ready to add the Better than Bouilion. Do I add the 3 tablespoon directly to the crockpot or do I follow the jar directions and dissolve it in hot water first? I add it directly in to the slow cooker. The flavor it adds is amazing!! I am new to slow cooker…won’t veggies be mushy after cooking such long time? Make sure to add the peas in at the end as they’re the only vegetable that would get mushy. The rest will be cooked perfectly! Enjoy!! I have just prepared all the ingredients in my crock pot, so no taste test yet. 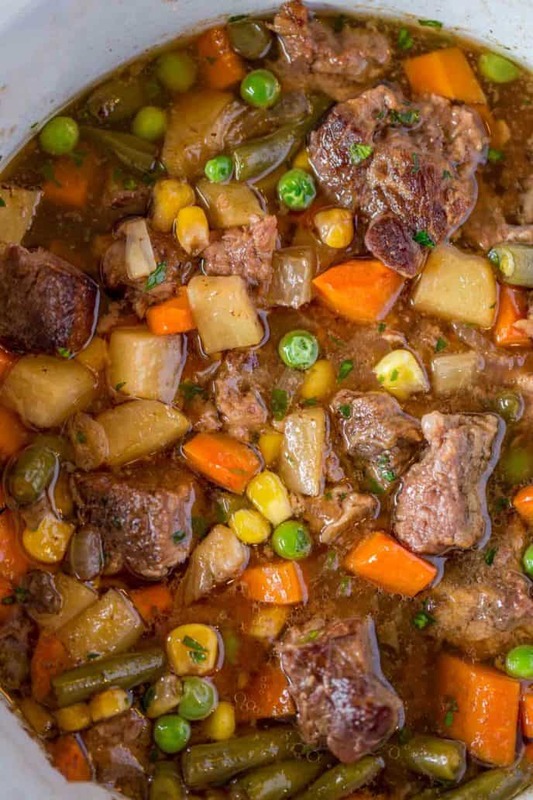 My only concern is that the “Better than Bouillon” beef base is high in sodium, so I wonder if you would really want to add any additional salt to this recipe? I bought some just for this recipe but it has over 800 mg./tsp. of sodium! I am also not excited about all the added ingredients, either. In the future I think I will buy their organic version! I really have to watch sodium so I used high quality sodium free beef stock with just a pinch of salt, 2 more hours in the crockpot and I can enjoy this soup! I did add sauté cabbage instead of potatoes. Do you use frozen corn? Canned corn? Thanks! I’m excited to try this. I tried this. I forgot the garlic…but it was still really good! I am going to freeze half to eat at a later time. It was pretty simple and came out really good. So glad you enjoyed it, Meg! Thanks for the 5 stars. Hi! Am cooking this tomorrow, and have already peeled and diced four potatoes. However, this seems like a LOT in comparison to the other ingredients… could you advise me as to about how many cups of diced potatoes? Thanks! There should be about 2 1/2 cups of potatoes. I hope you enjoyed it! I made this recipe and adapted it slightly- my family absolutely loved it! I added a tbs of Worcestershire sauce and half of a head of cabbage, not quite shredded but cut up thinly. I also made it on the stove, bringing it up to boil, then turning it down to simmer, partially covered for 2 hours. I used stew meat instead, and I think next time I will use it again, but only get 3/4 of a pound, and I think I’ll only do one potato and put some barley in as well. 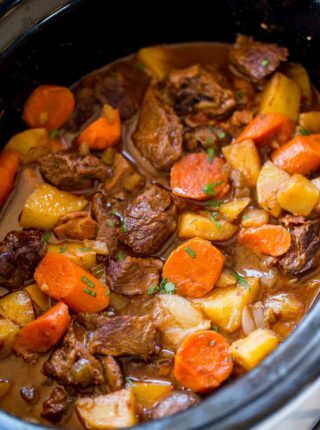 I will definitely make this again, most likely in the slow cooker- I just took too long getting it started, so I couldn’t wait for the slow cooker time! Thanks for all the suggestions! So glad you enjoyed it! Can I cook this on high to reduce cooking time? How would this recipe differ if I were to make it on the stovetop? This recipe looked so delicious but didn’t have enough time to cook in a crockpot. 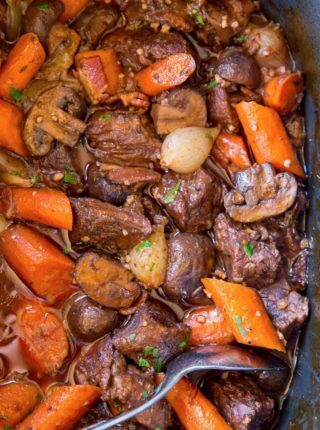 For a stovetop version, cook it in a covered dutch oven at 325 degrees for 2-2 1/2 hours. Enjoy! very easy to make. its delicious!! This is a wonderful recipe. I made it in my small 3 qt. Crock pot, so it was filled to the brim. I cooked it on high for about three hours or so. It was marvelously delicious!! I used 2 Tbls. of better than bouillon & about three plus cups of water due to my smaller pot. Note: It was very difficult to try to slice up the beef with a knife(too tough) I had to use my kitchen scissors) other than that, the soup was superb & I will make it again & again!! You can also buy the. Pre cut beef thats what i did. I’m trying this recipe today for my first time. A couple things I had to do differently but hoping it will turn out as good as it looks!! 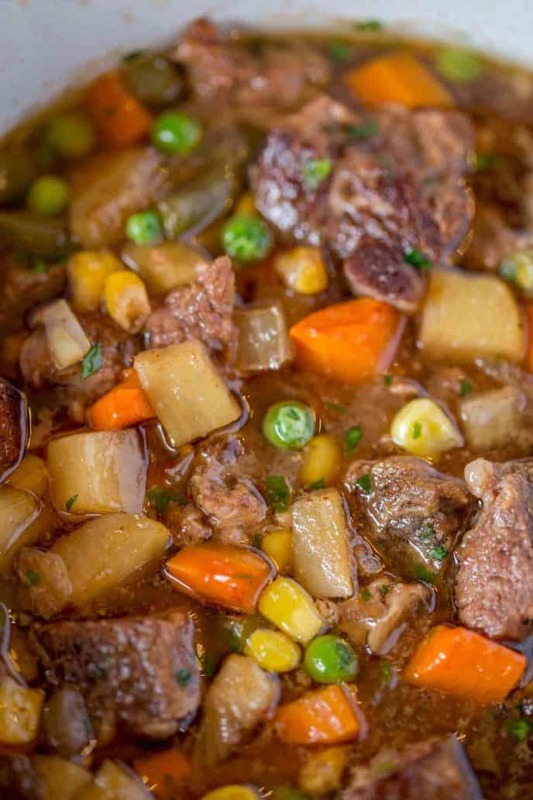 Love the Vegetables Beef Soup Recipe! Made it twice and came out just as yummy as the first time. Didn’t add or take away from the recipe. Fabulous recipe, My family loves it too! Thanks Dinner then Dessert! You’re so welcome!! I’m so glad you guys enjoyed it! Thanks for coming back to let me know! I had this in the crockpot and we were just sitting down to eat when an old widowed friend stopped by so I set an extra bowl for him. He ate two full bowls and we all raved about it! Fabulous flavor! I sent some leftovers home with him and made his night. Good food, good friends. Perfect combination. Another hit, Sabrina! Thank you so much Cindy!! So glad you enjoyed it and were able to send food home with friends. This is one of my favorite soups and I have some in my fridge as we speak! It looks sooooooo good! Its cold and rainy here and I just want a big bowl of this soup. I gotta make this one soon. Oh my! So easy, so flavorful! Will definitely make again soon.. I have my grandma’s recipe for beef soup, but this is so much easier! Looks delicious! Thank you! I love passed down family recipes but it’s fun to try new ones too! I love how you can just throw it all in the crock and be done with it! Such a hearty recipe! Definitely an easy, no fuss dish! This is perfect for cold nights! Yes! A cozy dish to warm you up! One of my favorite soups of all time!! I love using my slow cooker, it’s nice to walk in and dinner is ready with little to no effort. Vegetable beef coup is my favorite recipe! This one looks delicious too. Thanks, Leslie! Knowing dinner is taken care of is just one more thing to not have to worry about at the end of a day. Enjoy!! That looks so flavorful and satisfying! Love delicious recipes for the slow cooker! Thanks!